Something that never ceases to amaze me is just how adaptable a storytelling medium the humble comic book can be. In the same amount of page space you can create an epic spy thriller, explosive super hero romp, a high fantasy adventure or even a simple retelling of day to day life. Alex + Ada #1, by Jonathan Luna (artist and writer) and Sarah Vaughn (writer), is a delightful example of the latter and is as deserving of space in your pull-list as any high-octane mainstream comic. Admittedly, taken at face value Alex + Ada #1 is a sci-fi story and a cliché one at that. 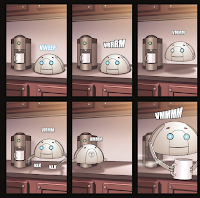 The futuristic setting of the book is one filled with helper robots that busily hover around to assist humans with day to day tasks, so it's definitely not like we haven't seen it before. 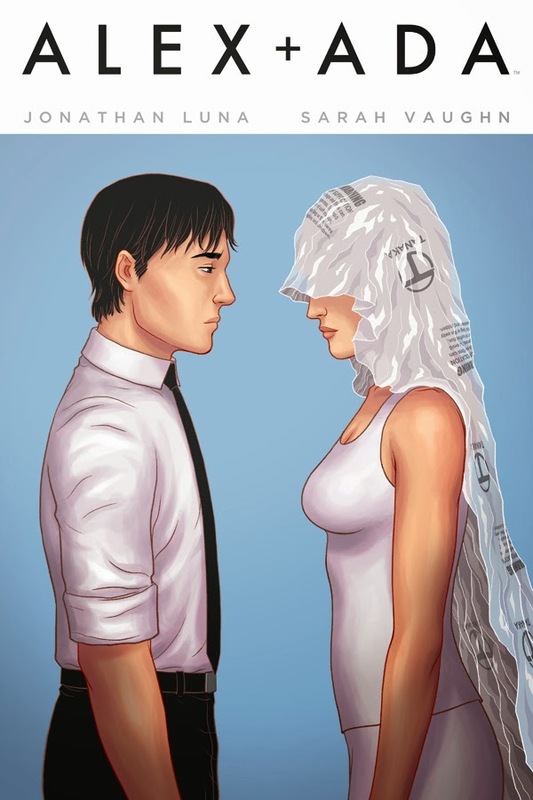 Even the key premise of the book, the story of a you man dating a robot, is well trodden ground. A couple of pages into this first issue and it becomes glaringly apparent that if you're going to enjoy this book you have to look further than the glossy sci-fi overlay and into the story's "slice of life" core - and that's where the books appeal kicks in. Alex + Ada is a book about the mundane told captured through a futuristic lens. The protagonist of the story, Alex, is very much an everyman sort of character. He lives in a nice house, works an office job and is getting over a break up with his long term girlfriend. The story is deliberately set at a snails pace and covers no more than two days of Alex's life. As I mentioned earlier, it very much shines as a slice of life comic with the main story, Alex's meeting with his companion Android Ada, only kicking in in the last couple of pages of this issue. 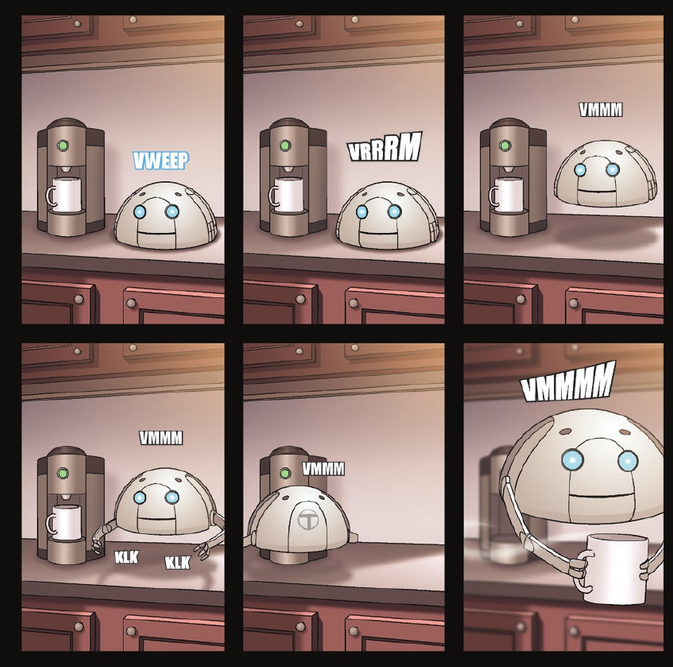 Luna and Vaughn have no trouble taking their time with small sequences, such as a robot making a cup of coffee, taking up whole pages. This stretching out of sequences really makes for immaculate pacing and a feeling that in the post-break up world of Alex, time passes painfully slow. The whole issue captures the numbness tha Alex is experiencing through the clean-cut and largely white design elements as well as the sparse dialogue. This overwhelming feeling of loneliness is suddenly shattered in the last few pages of the issue making for an emotional climax just as the book ends. The final pages are easily the strongest of the issue as each panel screams a thousand words. It's obvious that Luna and Vaughan know what their doing. So while Alex + Ada #1 may not "click" for everyone, it's all too easy to get bogged down in the books more cliché elements. There's a great story here for the careful comic book reader. Underneath all the robots and technological marvels is a simple and relatable story that resonated with me on a very personal level.